My daughter is in her 20s and to this day I call her Princess. I think it's because that's what my father always called me. Or maybe it's just because she has always enjoyed dressing like one and being treated like one. She's turned into a Princess mentor. This was a quick shot last time I was home, as she and a good friend's young daughter took on baking princess cookies. They didn't have crowns on but there's no mistaking that princess stance. And now I am seeing other up and coming princesses everywhere I go. Even in the Corbett Court Mall in Galway. On a stop there last week a table near me filled up with them. 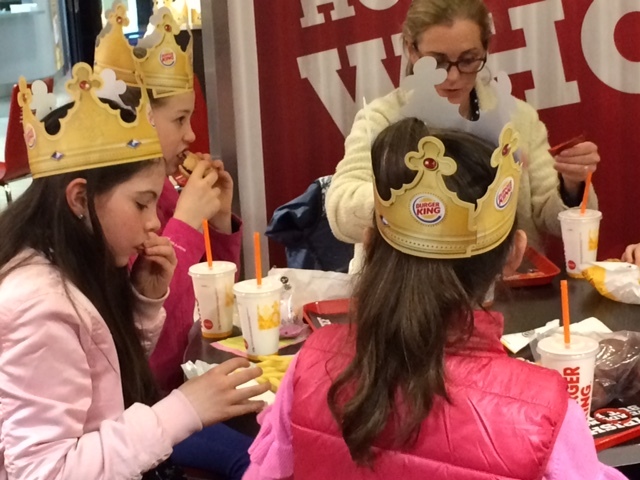 A half dozen princesses , all but one in pink, each with her own crown, just out for a royal lunch. Of course they'd pick Burger King. Lunch comes with a crown.